Breaking Through is a documentary on confronting the demons that stand in the way of living life fully, told by those who ran openly LGBT campaigns and won. In this feature-length documentary, openly LGBT elected officials tell their stories of self-doubt and triumph, revealing a deeply personal, rarely seen side of politicians and gay people. 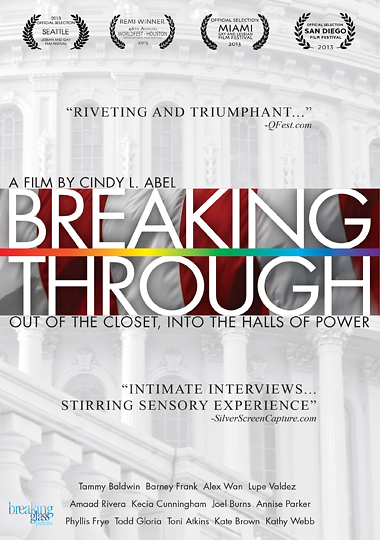 In Breaking Through, they describe the conflict they experienced between the barrage of anti-gay messages they were made to confront and their desire to live open and fulfilled lives. First they broke through internally – by daring to believe something different than the negative messages they were told about themselves. Then they broke through externally as they pursued and achieved the future they envision. Their triumphant stories demonstrate how these LGBT leaders learned to be authentic and achieve their dreams even in the rough and tumble world of politics. Their stories are complemented by interviews with religious and cultural leaders who have helped shape public opinion, and with political and human rights activists who provide historical context. As these openly LGBT elected officials share their stories of living fulfilled lives, they bring hope to others still struggling to embrace all of who they are.